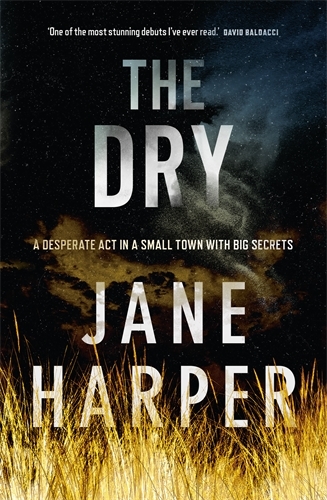 The Dry, the debut novel by journalist Jane Harper won the 2015 Victorian Premier’s Award for best unpublished manuscript. But it is a wonder that it had to go this route to get published. The opening of The Dry is a sadly familiar story. In a small town in drought affected country Victoria a struggling farmer, Luke Halpern, kills his wife and ten year old son and then turns the gun on himself. Only his baby daughter survives. Aaron Falk, driven out of town as a teenager and now a federal policeman specialising in fraud, returns for the funeral and is asked by Luke’s parents to look into the deaths. It soon appears that that all is not what it seems. But Aaron, still held under the suspicion by the town for the death of his friend Ellie Deacon twenty years before, does not want to stay. The Dry does what all good crime novels do – it uses Aaron’s investigation of both the current and historical crimes to shine a light on the town, its inhabitants and their often unforgiving environment. In doing so, Harper is able to explore broader social themes and issues affecting rural Australia. There are some obvious character types but none feel clichéd. The town of Keiwarra, the surrounding landscape and its inhabitants are brought starkly to life. Tensions and suspicions still linger after years, secrets and grudges are held tightly. Harper uses an easy flashback style, slipping effortlessly between the present and both the recent past and distant events. The main mystery is cleverly set up. There is plenty of misdirection but also, when the killer is revealed, a realisation that the hints were all carefully embedded in the narrative. The historical crime is a little more obvious, but it is grounded in the behaviour of its teenage characters and the tragic effect it had on all of their lives. The Dry is a strong debut. A classic crime novel in a classic Australian setting, with strong characters dealing with universal issues.